In the Gospel of Matthew, there are three great discourses having to do with “the Kingdom of Heaven.” First there is “the Sermon on the Mount,” chapters 5-7, giving the laws of the kingdom. Then there are “the Parables of the Kingdom,” chapter thirteen, giving the trend of the mystery form of the kingdom. 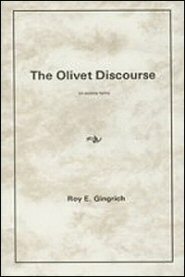 Finally there is “the Olivet Discourse,” which gives us much information concerning the great eschatological events which will occur just before the inauguration of the kingdom and it should be studied along with Daniel, Revelation, and other prophetical books concerning the end-time, as is stated by the author of this commentary, Mr. Roy Gingrich. We need to know the events that are prophesied to occur that we might prepare ourselves for the fulfillment of these events. As is sometimes said: “Coming events cast their shadows before them” and these shadows become darker as the time of the fulfillment of the events draws closer and closer. The shadows of the eschatological things prophesied in “the Olivet Discourse” are now very dark, so we know that the time of their fulfillment is nigh, even at the door.